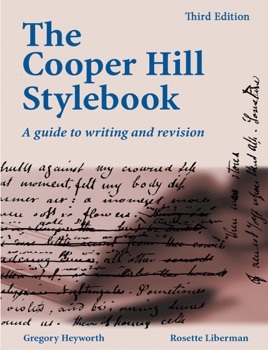 Now in its 3rd edition, The Cooper Hill Stylebook is the classic high school and college revision manual. It’s a 580-page, practical, step-by-step how-to for every writer. Based on 70 years of experience in high school and university classrooms, The Stylebook helps teachers cut correcting time in half and turns students into independent learners with all the revision expertise they need immediately at their fingertips. •	FAQ at the beginning of each chapter anticipates questions and defines terms in student-friendly, classroom-tested language. •	Explanations to grammar/writing problems use short sentences that define terms and avoid jargon. •	1500+ humorous and topical examples illustrate and correct errors. •	Up to 50 exercises follow each part of every chapter to provide practice. The 1000+ exercises are drawn from the arts, humanities, sports, sciences, and pop culture and represent actual student mistakes. •	See Answer after each question provides immediate answers and explanations. •	Includes a ready-made unit on rhetorical fallacies for courses in journalism and media studies. This book is one of the most helpful grammar and writing resources that I have come across during my time as a high school student. Not only does it give full-length explanations on almost every grammar question anybody could have, it also gives examples during the sections. Having the practice work at the end of the chapters helps, because with each one there is an answer button where it not only gives you the answer to the question, but also gives you the reason why that answers is correct. This book is very different from most of the other grammar books, because it doesn’t leave you asking questions. I would highly recommend this book to anyone who is struggling in grammar or writing. I am a junior in high school, and I use this book as a reference source in writing my essays. It shows both the correct grammar and all the different ways to make sentences clear and get rid of extra words that one doesn't need. At last I understand how to get rid of passive subjects and how to spot redundancies. Also, unlike other grammar books, this one is easy to understand and has informative yet funny examples. This stylebook has more examples and exercises than any other book like it. What’s great is that each exercise question has a See Answer you can click, and a window opens with the right answer and with why it’s right. Plus the Search window is quick and easy to use. I’m a senior, and I know I’ll use it at Columbia this September.